Hi there! Thanks for stopping by my blog for the Glue Dots and Pink & Main Blog Hop collaboration, where you can win a $25 gift card just for leaving a comment. Winners will be announced on Wednesday, September 26, 2018 at 6am. For today’s card, I decided to use the new stamp set from this month, Eskimo Kisses, and its coordinating dies. I stamped this out on white cardstock and used the dies to cut easily cut all these images out. After I colored all the images I cut out, I decided that I wanted to use the Box Card die, which made creating an interactive card extra easy! Once I cut out the box card pieces, I used Glue Dot’s glue lines to put everything together. These glue lines are perfect for the tabs that make the box card. Two work perfectly for the side tabs. For the inner part of the box, I used Bristol Smooth paper and created a Northern Sky look using distress inks and white splatter. I truly believe that white splatter makes anything into a galaxy or a star filled sky. For the outer part of the card, I die cut out blue paper to mimic ice. Once, I did that I used the Glue Dot’s glue runner to tape all these pieces to the box card. 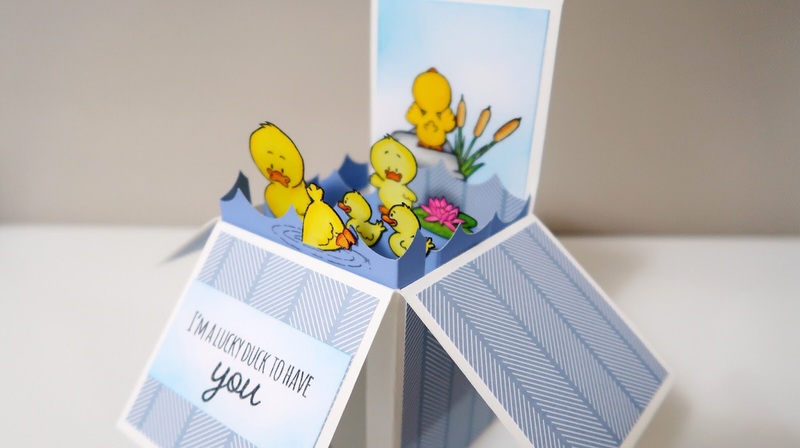 I was able to use various Glue Dots adhesive to add the stamped and die cut images to the box. It works really well since Glue Dots has a variety of sizes so it could be added to the nooks and crannies of the images. In particular, the mini dots are a favorite for box cards. Look at the little girl’s feet! They are so small but the mini dots fit perfectly on behind each shoe. To finish off this card, I stamped out the sentiment on the matching blue on the interior of the card. I loved how this card turned out and can’t wait to give this away! I hope you enjoyed it and the blog hop. All the other participants are listed below… and remember to comment for a chance to win! Enjoy! Jeannie — You are here! Hello everyone! I had made this pop up box awhile back and there were a lot of questions about how to go about doing it. It’s actually a pretty simple card, especially now since there are pop up box dies out there. I, however, did it the old fashioned way and made mine from scratch. 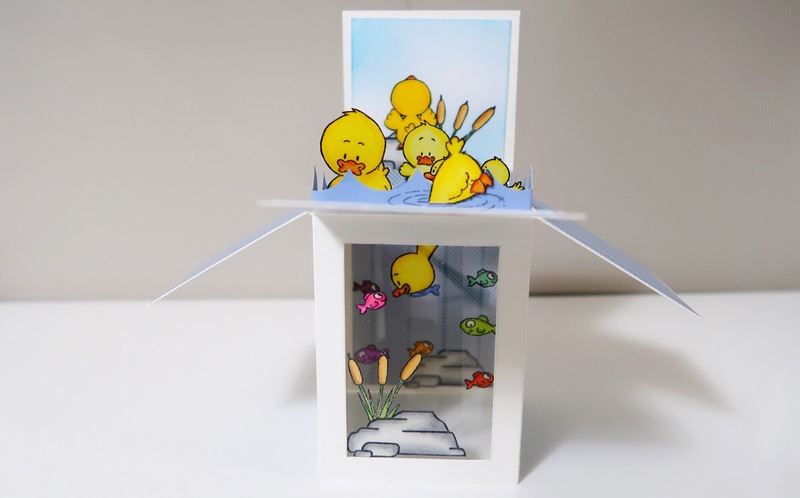 It’s actually bigger than the pop up box dies since those are A2 sized so it’s a really good card for a special person. It’s quite hard to explain how I created it since there’s a lot of steps, so I made a YouTube tutorial on the steps and all the measurements are listed at the end of this post. The bottom window, which is the main feature, is one I cut out with an Xactoknife. Using acetate and a xyron sticker maker to adhere the images, it adds a special element to the card. 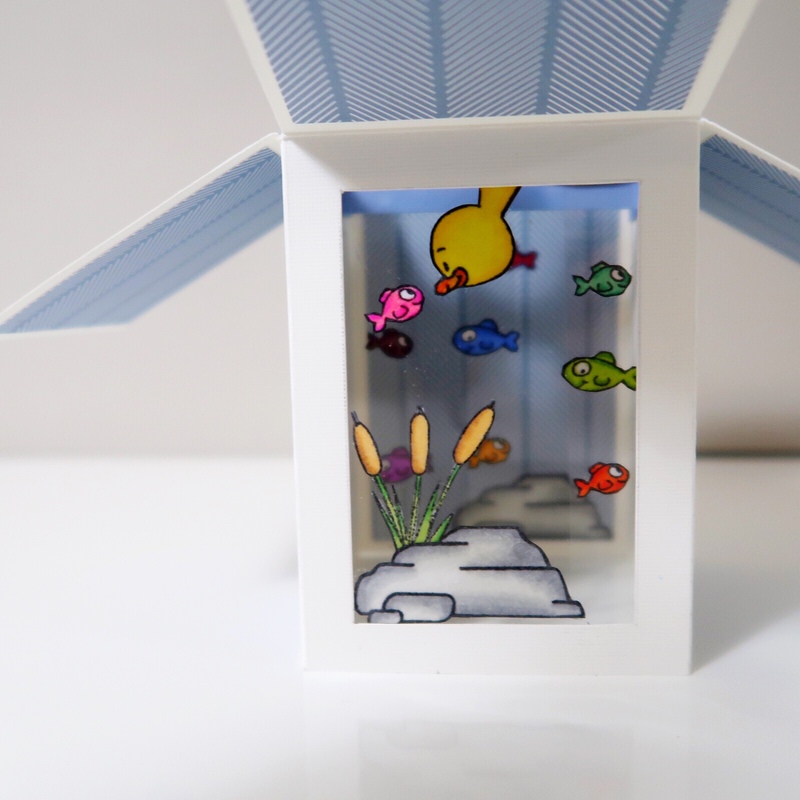 The fish hang from the waves above and appear to be floating in the “aquarium”. Don’t you just love acetate?! I hope you all enjoy this card! It’s a really fun one. It has a lot of moving parts but if you pre-cut everything out first, and then assemble, it actually goes pretty quickly.